Pondless Waterfalls are a very popular landscaping component that many customers are choosing to add to their backyard or even front yard landscaping. Pondless waterfalls are far less maintenance than the standard pond waterfalls. The idea of a pondless waterfall is to have the beauty of the waterfall both in sight and sound but the water then disappears only to be recycled and returned to the top of the waterfall. There are no chemical treatments required and you don’t have to worry about plant life like algae taking over your pond and the constant hassle of having to try to keep your pond fish alive. Pondless waterfalls do require some subsurface excavation in order to create the reservoir for the water once it reaches the bottom of the waterfall. There are a lot of choices when it comes to the styles of pondless waterfalls you can choose from. 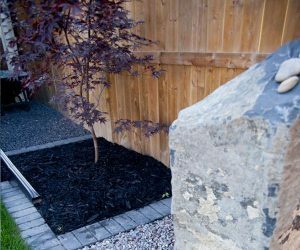 Many types of stone can be used including river rock, river boulders, sandstone, and rundle rock. How you dress up the perimeter of the pond is up to you but it typically includes a nice selection of perennials, shrubs, and fixtures.